Rouge in love, the new collection of Lancôme is categorized in 3 moods: jolis matins whitch are shades for daytime wear, boudoir time whitch are pop shades for cocktail hour and tonight is my night: intense shades for magical nights. Sequence of love (170N) belongs to the third category. I bought this cool true red at the airport for 22 euros. I must say that I'm very happy about it! On the package it says that the lipstick should stay 6 hours and it really does. The red is really pigmented and even when some of the colour is gone because you've eaten or worn it a very long time it still leaves a beautiful red glow. The lipstick is very creamy, pleasant to wear and it doesn't dry out your lips! 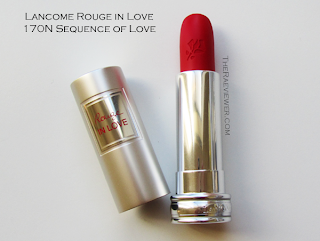 If you're looking for a new lipstick I highly recommend Lacôme! Emma Watson is wearing N 170 on the picture and Kate Winslet even wore it on the red carpet for the titanic premier!